The Tabard of Flame is a reward from the Landro Longshot Loot Card, which is found in booster packs from the Heroes of Azeroth Expansion Set. 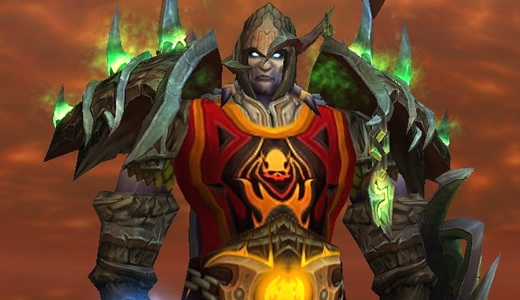 Tabard of Flame is an epic quality tabard, but it can be worn by characters of any level. Tabard of Flame counts towards the Twenty-Five Tabards achievement. The Tabard of Flame has the distinction of being the only tabard not available via UDE Points. The Landro Longshot Loot Card is found in booster packs from the Heroes of Azeroth Expansion Set, at a rate of 1 in every 121 packs. Heroes of Azeroth booster boxes run about $50.00 each and contain 24 packs of cards. 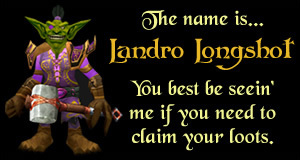 At that rate, the estimated cost to acquire this fancy tabard by pulling a Landro Longshot loot card, would be approximately $250.00. 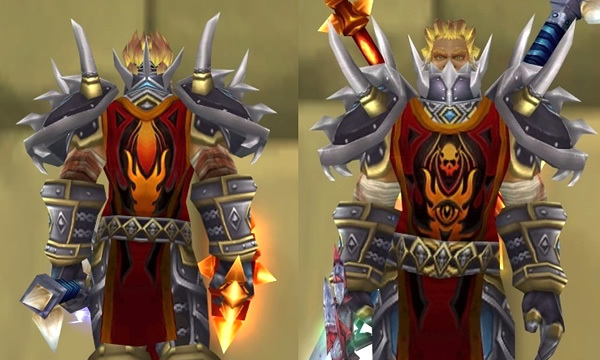 A look at the Tabard of Flame in-game (second half of the video offers a look at the rare Tabard of Frost).